Stammering, 8-year old Carson Diersing mustered up every ounce of guts he had to tell his harmonica teacher, Indiana music legend Tony Cooley, that “Skip To My Lou” (his first assignment) was not his style. Mr. Cooley looked Carson straight in the eye and proclaimed, “You’re 8 years old. You don’t have a style.” Two weeks later Tony encouraged Carson’s family to go to The Bean Blossom Blues Fest and enter young Carson in his first harmonica contest. Carson did—playing “Skip to My Lou,” naturally. However, Carson was stunned when he was announced the first-place winner. He walked onto the huge stage at the Bill Monroe Campground—and from that point his life changed: “Looking out at that huge crowd that day did something to me—the energy was astounding!” Carson recalls. He never looked back—deciding there that he would make his life making music. Carson began playing as much as he could, and continually sitting in with other artists—and his life became a whirlwind. By 12, he was featured on “Yoke’s Easy” from Bobby Hayden’s Broadway Project with Ozzy Osborne’s late drummer, Randy Costillo, and Meatloaf’s original bassist, Rick Bozzo. 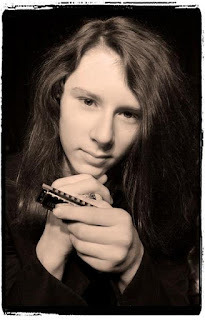 At 13, he became the youngest harmonica player in history to be endorsed by Hohner Harmonicas. Just this year, he won the 2012 Honeyboy Edwards Fund for the Blues at The National Blues Museum, and will attend a master class in Clarksdale, MS. Along the way he picked up an endorsement from Shaker Microphones, was photographed by world-renowned rock photographer Robert M. Knight (in Indianapolis, and on Memphis’ Beale Street)—all while notching shows at The International Blues Challenge (Memphis), The Super Bowl Village, The Indianapolis 500 Hall of Fame, NHRA Nationals, The Hard Rock Café (Chicago & Memphis), and BB King’s in Memphis. Part of the intrigue surrounding Carson’s music is how effortlessly he honors the past—while unapologetically showing his youth. And the music world has noticed: “Once every decade or so I get the opportunity to work with a true prodigy. THANK GOD I lived long enough to hear Carson. At 13 this kid is better than most 40-year harp vest. The kid is the harp player of tomorrow, and he’s playing it today!” proclaims legendary Indianapolis music promoter Bill Levin. Carson is both self-confident—yet supremely humble. He knows exactly who he is musically—citing Jimi Hendrix, Howlin’ Wolf and Tony Cooley as his biggest influences. Yet, Carson is equally passionate about his guitar playing and singing—and is committed to making films about skateboarding (he’s also an avid skater). For Carson, music is all about communication. “I want my music to tell stories and influence people. I want to write music and perform music that makes people want to hear more.” This was a dream he realized while playing at The Super Bowl Village in Indianapolis. Despite the rain, the huge crowd was extremely receptive—with everyone from toddlers to 80-year olds dancing along with his music. In short, Carson’s music is infectious, and transcends boundaries.